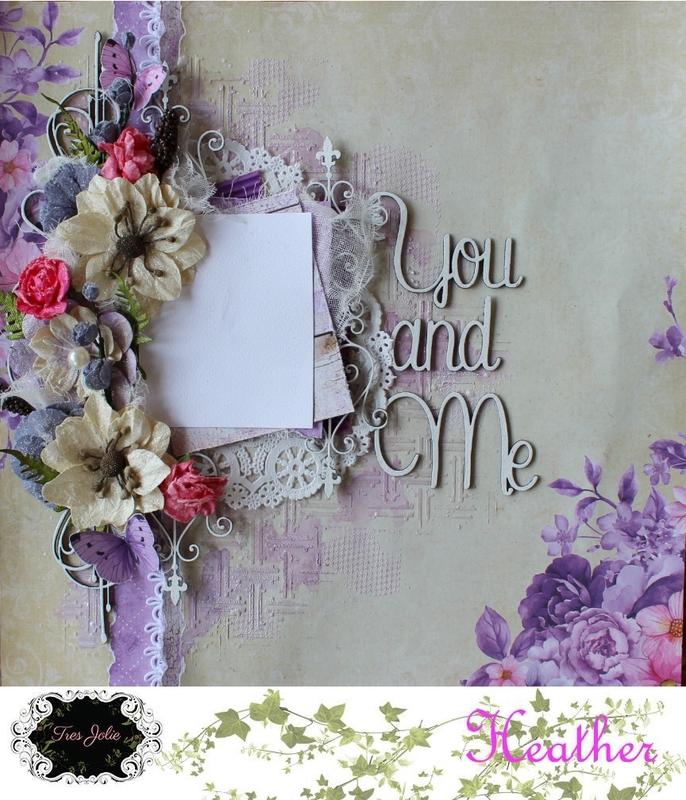 It’s Friday again… and I’m back with another layout for you from the gorgeous July kit from Tres Jolie Kits. I have used the natural cream colours in the kit on this layout highlighted with the gold….. have you seen that gold lace in the kit yet? It’s gorgeous!! I have some photos for you of my process in creating this layout. So lets get on and show you. Start off by choosing a background paper and a feature paper. Cut the second paper to make a border down the middle. Distress the edges and ink all edges on both papers. Stick 2nd paper down the middle, mine is slightly offset from the middle. Cut a strip of the GORGEOUS gold lace and stick down overlapping the left hand edge of paper 2. Next choose a stencil and using white texture paste spread in patches over the layout where you ant the stencilling to show. So you end up with something like this. Fit the chosen photo on the back of the biggest shabby white frame. And hot glue onto the layout. I love this butterfly sheet…. cut out 3 butterflies of choice. I used the beige flowers from the kit and started to arrange on the layout with the butterflies. The smaller shabby frame I glued to the lower right side of the design to balance it. I had some Viva Inka Gold in my stash which using my finger I have rubbed over the higher parts of the pattern on the shabby frames. I then used a stamp from my stash and some Toffee Versafine ink…. ….. and stamped down the edge of paper 2. I added some Nuvo in groups of 3 drops…..
…… and dropped some microsphere beads into it whilst it was still wet to create berries. I then stamped some flourishes from a stamp out of my stash . 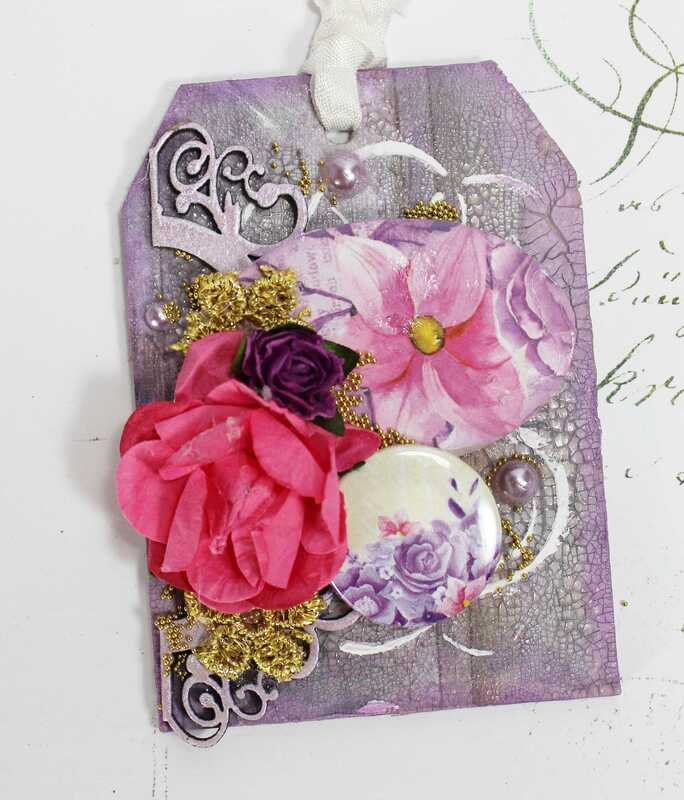 Using stamps is a great way to create extra embellishments or even just embellishments in a colour to fit in with what you are creating. They help to fill out a design or add an extra feature. Fussy cut the flourishes out. Add them to the flower clusters on the layout. I also stamped a title verse and fussy cut that out and added to the layout. 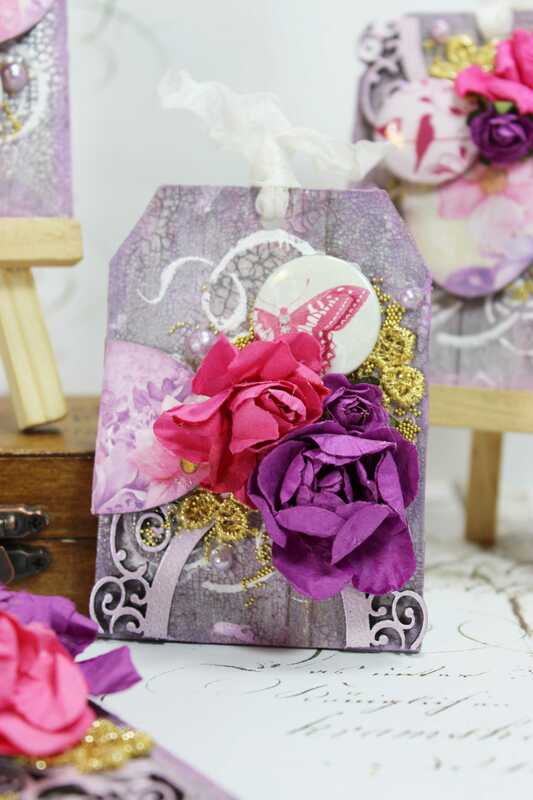 I love the neutral colour tones to this layout from a very predominate purple kit! Here is what you get in the Scrapbook Kit for July. I’m sharing the layout I created using this months mood board challenge. I love jump starting my creative process with all kinds of challenges. Sketches and Mood Boards are my 2 favorites. So you will see a lot of those challenges here at Tres Jolie. You can be inspired by all or just one of the photos or just the overall mood. Just a hint. The colors match perfectly to our July kit. I was inspired by the overall mood, the colors and the frames. This is my floral cluster in the top right corner. You can see the frame I used. I cut that tiny gold flower from the lace in the kit. I did some stamping in black and random splattering with some mist. Here you can see more splatter, stamping and pieces of the gold lace. I love that you don’t have to do a lot to the background of this paper. I did some layering behind the photo. The doily is included in the kit. Here is a list of mist and embossing powders that I used while working with this kit. These are all from Lindy’s. That’s all I have today, but make sure you keep coming back to see what our designer have in store for you. 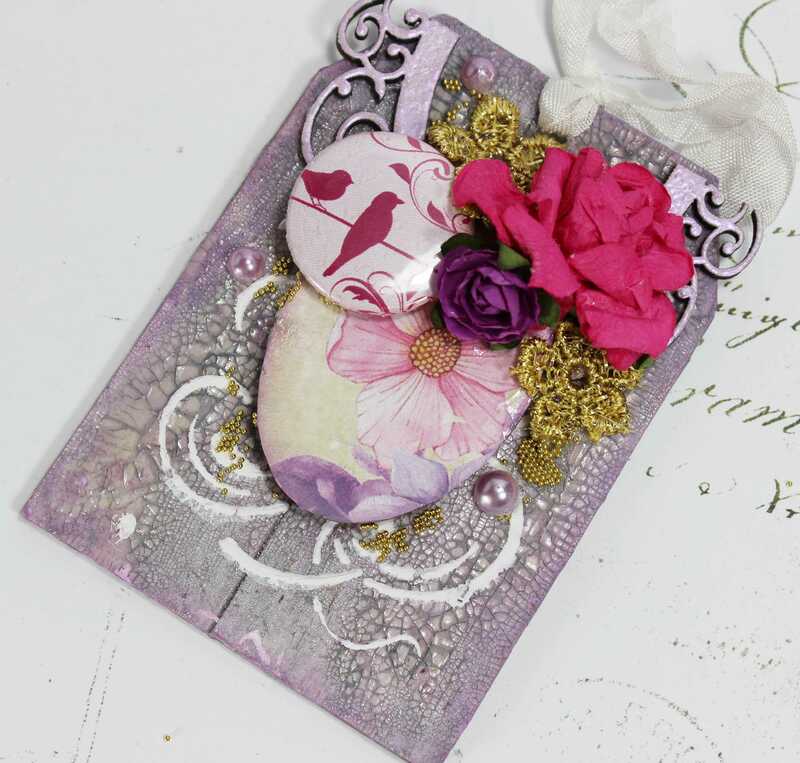 These mixed media kits are fantastic, within the kit is a whole project to complete from start to finish, all the ‘mucky’ products (as I like to call all the paints and mediums lol) and the final embellishments to create your own masterpiece! This months kit included a paint brush! It has been great seeing what the other DT members came up with as you will find out! And I’m looking forward to seeing photos of what you guys create too! I used the paint brush and the embellishments to create a canvas. The kit came with a boxed set of Mixed Media essentials from Finnabair Art Basics range. These included clear gesso, black and white gesso in 2FL.OZ tubes, a good amount of each. I have used the clear and the white on this project. The canvas had a base coat of the clear gesso over it before anything else and then a coat of white gesso to create a good background. and 4 doily patterns over the canvas overlapping it off the edges of the canvas. Next came the fun part with the PearlEx colours. We had 3 gorgeous colours in the kit and the Gum Arabic. The Gum Arabic is a binder medium, mixed with the PearlEx and water it creates transparent water colours. It says on the pot to mix 1 part gum to 4 parts pigment (PearlEx) this creates a strong colour, I used a little less pigment to get a slightly softer colour. Generally play around with amounts and strengths to get the colour and consistency that you want. Over the spoon I used the gum and PearlEx but with not much water to get a thick consistency to sit in my spoon, the colour is stronger that way too. I used the mixed watercolours over my canvas with a paint brush, one at a time allowing for some drying and using the palest colour first, building up a blended multi tonal effect. When dry I added another layer of white texture paste with a different stencil. This stood out nicely then against the coloured background. Next step is to choose your main embellishments. Mine obviously is the paint brush but also I wanted to include the gorgeous little light bulbs and the spoon! These I have all stuck on the canvas with a soft gel medium. I find this sticks anything to a canvas really well. Allow time for it stick completely but you can still work on it whilst it is drying. Stick the brush to the canvas with the gel medium. Paint over the brush with the white gesso and allow to dry. I then used the watercolours again on the brush running them down from the top of the brush to get a dripped effect. When dry stick the spoon to the brush. I used some of the Finnabair Mechanicals on the background too. Again these are stuck on with gel medium and then painted over with white gesso and the watercolours. I layered one up using the middle cut section of a doily from the main kit underneath it. At this point I switched to my hot glue gun to stick these embellishments. I set the bulbs on top of the Finnabair Mechanicals Wings and then decorated with flowers. To finish the embellishment clusters off I did add some very pretty glass beads from my stash and a chippie word title painted in gesso and some pearls. I used a sponge applicator to dab the tops of my flowers with white gesso and flicked some of the watercolours over the canvas to get a nice splattered effect. I added some small detail with the microspheres from last months MM kit. That’s the nice thing about these kits, you end up with a great stash of products which can then be used on future projects too. The PearlEx in the spoon has been added over some soft mat gel just to make sure the thicker PearlEx solution did stick and stay where I wanted it too. Project like these are so easy because really anything goes. There is no right or wrong way and each piece created is unique and individual to the person and creation. Just have fun, be brave and go with the flow and experiment. You cant go wrong! Here is what you get in the Mixed Media Kit for July. 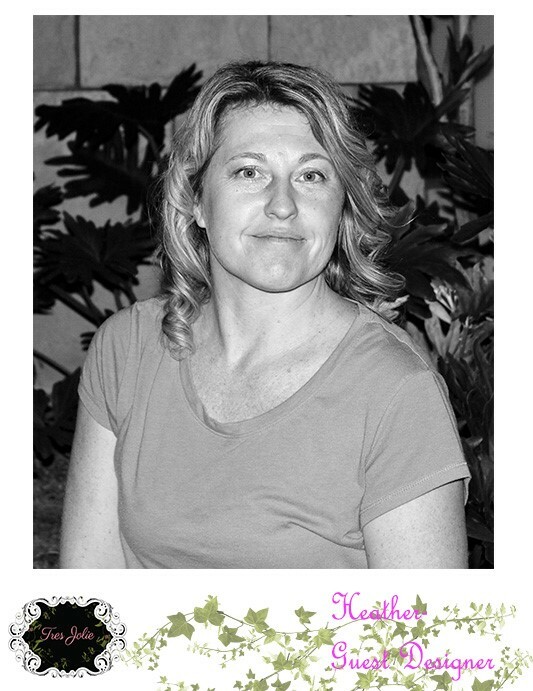 You can find Tres Jolie on the following social media sites. Hope you have enjoyed looking at my project today. Any questions please get in touch with us either here in the comments feed or on the Tres Jolie Club Café page and we will all be pleased to help you! We LOVED the vintage vibe Donna created with this layout of a sweet young couple. The treatment of the chipboard frame looks amazing! The bits of ephemera and that cameo are perfect, not to mention those butterflies! Congrats, Donna! Your prize will be shipped with your next kit! And, thanks to all who played along! We were blown away at all the gorgeous entries! Be sure to join us for our July mood board challenge! I’m also sharing my first project made with the July scrapbooking kit, featuring the lovely Lemoncraft Violet Silence paper collection. For this layout I used the June Sketchabilities sketch. I started out by cutting up the “wood” panel background paper in strips along wood lines, then I used a paper distress and added some brown distress ink along the edges for added dimension. For my layers, I added the doilies from the kit, some paper layers, and added the Prima Marketing resin frame to the picture. 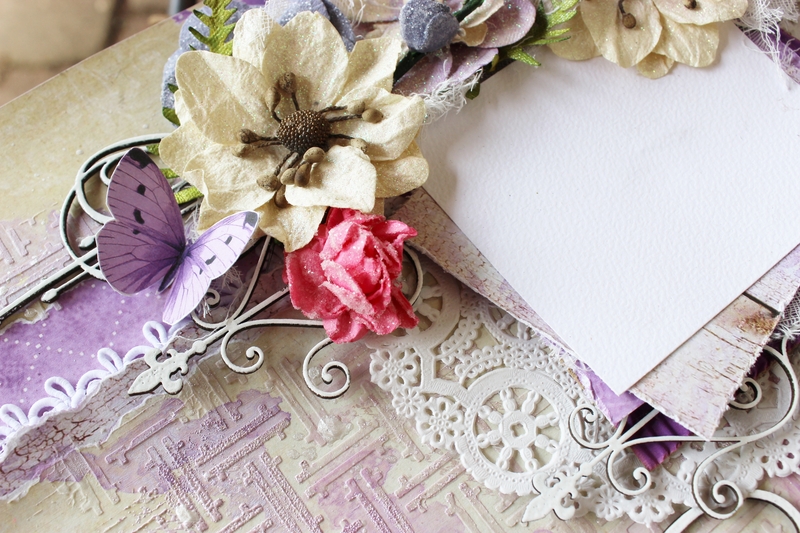 I topped of the layers with butterflies I cut from one of the papers, the cream and purple 49 and Market flowers, as well as some small coordinating flowers from my stash. I also added the title “Shine” from my stash as well, which is a Dusty Attic piece that treated by adding some wax paste. I added some stenciling of bricks to peek out from under the design. I used white crackle paste, then lightly used a foam applicator with brown distress ink over the crackles after the paste was dry. I treated the Dusty Attic chipboard scroll by covering it with a thick layer of the Nuvo drops from the kit. While wet, I added a combination of gold and black embossing powder while the Nuvo drops will till wet, then used a heat tool to dry it- I let it bubble up to create this distressed old metal look. I added the leaves under the flower cluster before gluing on the chipboard to the paper to create more dimension. For this bottom cluster I added the smaller Prima resin frame, a tiny purple flower from my stash, and a Lemoncraft flair button to repeat some of the features from the main cluster on the layout. Thanks for stopping by the blog today! Be sure to check us out on Facebook and join our community! 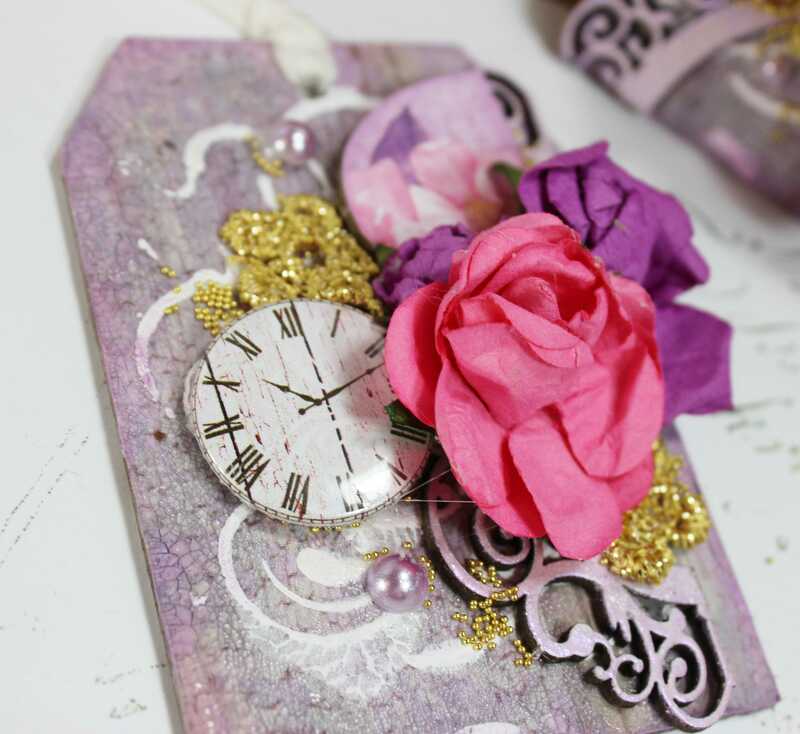 If you haven’t already subscribed, you can still purchase this scrapbooking kit! 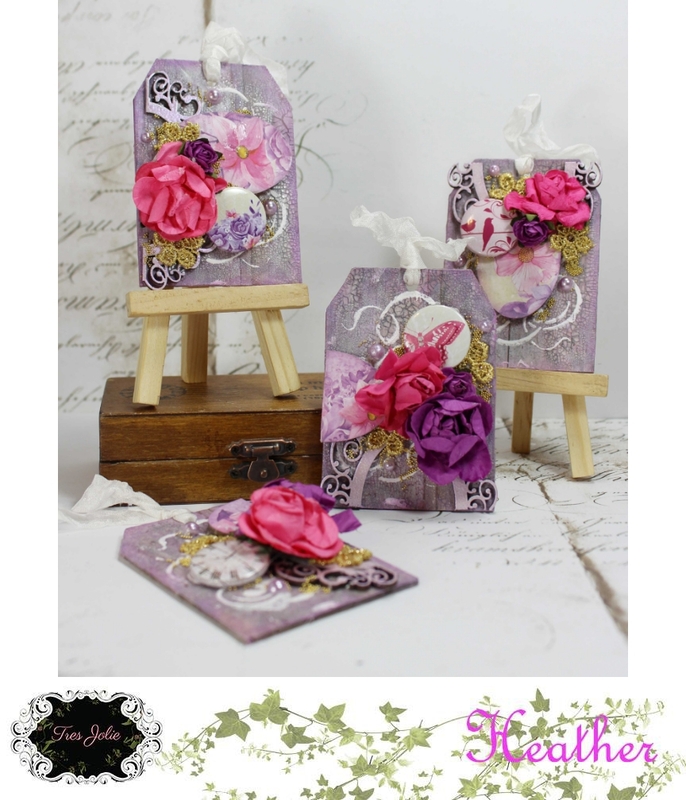 Welcome to the gorgeous July Tres Jolie Kit! It’s a beautiful kit, I love these papers from Lemoncraft and the pretty purple colours in them! 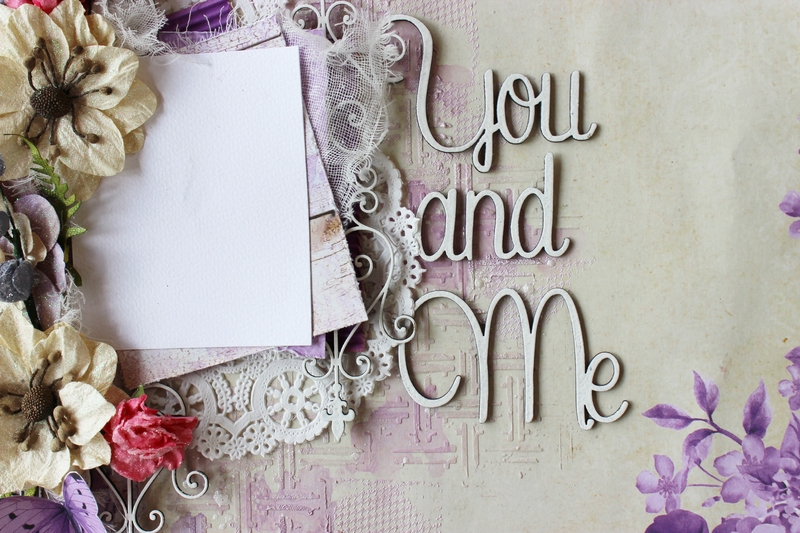 Today I’m sharing my layout I created based from the mood board challenge this month. This mood board was gorgeous too! I based my layout using the top right photo on the mood board keeping to the paler colours. More details on the challenge at the end of this post. I loved the wood panel paper and distressed the edges heavily and inked with a sandy brown ink pad. I backed this paper onto a plainer lilac background paper. You can see I have used a stapler to fix the top paper to the background paper. This is a fun different way to attach papers together and adds a little different detail to the layout. I used paper distressed edged paper layers of various size oblongs to back my photo on. These were all inked as well and layered up using the doilies. The doilies are cut in half so I do not waste any unnecessarily put under the other papers but just the cut edge slipped under a paper. I used some washi tape from my stash just to add a little more butterfly detail. The 49 & Market flowers are just divine. And the leaves that came with them are super too! I clustered these up together using the rule of 3, to balance the layout. I added some small drops of Nuvo to the leaves and used the badges in the clusters too. Products used on this layout. There is a sheet in the kit absolutely full of butterflies! 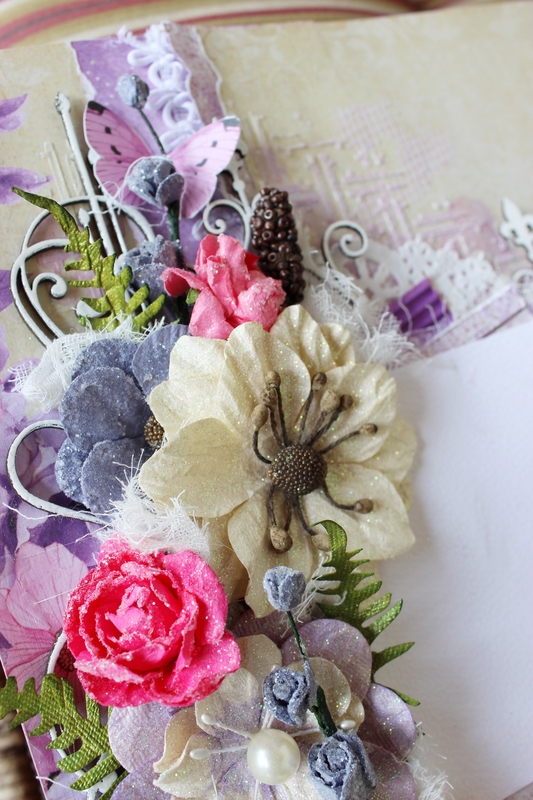 Perfect to fussy cut out and add to your flower clusters like I have on my layout. The only problem is choosing which ones to use! I hope your inspired to join in with this mood board challenge this month with us! Simply create a layout with inspiration then from the mood board, and add a photo of your finished layout onto the Mood Board Challenge Album on the Tres Jolie Club Café Facebook page. We look forward to seing your creations!